Gżira: N. Vasovic 12, C. Crossland 20, P. Shoults 5, L. Stefanovic, A. Perunicic, N. Xuereb, M. Gouder, V. Pace 16, I. Mitrovic, J. Guity 19. Starlites: A. Felice Pace 10, O. Psaila, N. Formosa 2, R. Bonnici, I. Felice Pace, C. Ward 23, M. Falzon, M. Scerri, R. Carabott, W. Darley 9, A. Sears 2, J. Stotts 28. Referees: Z. Dobrosavljevic, D. Torok, M. Hraisha. Starlites: A. Felice Pace 14, O. Psaila, N. Formosa, R. Bonnici, I. Felice Pace, C. Ward 18, M. Falzon, M. Scerri, R. Carabott, W. Darley 14, A. Sears 2, J. Stotts 29. Gżira: N. Vasovic, C. Crossland 35, P. Shoults 2, L. Stefanovic, A. Perunicic, N. Xuereb 8, M. Gouder 10, V. Pace 29, I. Mitrovic, J. Guity 6. Referees: B. Vassallo, T. Mantere, K. Dworniczak. The first game resulted in a high intensity game with regular spurts of spectacular play ending in a marginal victory for Starlites GIG but all to play for in the second game. Both sides had different leads along the 40 minutes of play, with the margin at times also being of double digits. The first quarter was a low-scoring one with the two sides initially wary of each other so early in the two legged-final. With Americans Connell Crossland and Julio Guity getting the team’s initial hoops, Gżira Athleta had the first lead and closed off the first quarter 15-8 ahead. Starlites had a positive start in the second quarter and overturned the score within three minutes and taking a 20-19 lead with Cameron Ward, Drew Sears, Nick Formosa and Jordan Stotts grabbing the points. Two other Ward treys and consecutive Stotts close-range plays kept Starlites in front and although Athleta did have a late six-point run, the score was 39-36 for Starlites with a very late Stotts three-pointer and an Alec Felice Pace hoop. When play restarted Gżira Athleta showed more consistency and in fact won the third quarter 23-15 and also had a double digit lead 55-45 midway in this session with Guity and Nikola Vasovic netting most of the baskets and forcing Starlites for an early second half timeout. This helped Paul Ferrante’s side to reduce the deficit by half by the end of the quarter and then continued with an initial 7-0 run, with a Felice Pace trey on either end of a brace of Stotts’ baskets so that the lead changed hands once again. Further Felice Pace points helped Starlites to a 68-63 lead but then Gżira Athleta were the only side with points in the next three minutes and the last round of the clock started with a marginal one-point lead for Athleta, 72-71. In the last moments of the first match, Ward banged in two shots from the charity line and, shortly afterwards, Stotts added another from two so that Starlites took a small two-point lead going into the second match. The second leg was also a tight duel with both sides feeling the importance and tension of the match especially in the first half and with play becoming more open and technical after the break. It was Gżira Athleta who finally had the upper edge as they had most of the lead, inspired by their high-scoring American duo Vincent Pace and Connell Crossland, with Starlites chasing for most of the game but always just a short step behind. The series was practically always open until the very final moments when Gżira Athleta managed to open a double-digit lead with the time clock firmly in their favour. With both sides setting off at par after the initial toss, Starlites were 9-8 ahead after five minutes but then dried up for over four minutes of play. Athleta then amassed eight straight points through Crossland, Guity and Nathan Xuereb. The resulting margin was neutralised by Starlites midway through the second quarter as Stotts, Felice Pace and a William Darley trey placed the Naxxar side 25-23 ahead. Once again Athleta managed to overturn the score with Matthew Gouder helping the Pace/Crossland pair for a 38-34 half-time lead and a two-point advantage on aggregate. The series remained very open after the interval as Starlites remained in Athleta’s heels and the sixth minute had a brace of Felice Pace hoops putting his side ahead on aggregate even though 44-45 behind in this game. Here came an interesting and important moment for Gżira Athleta when they managed to outscore their rivals 13-3 till the end of the third quarter so that they opened a double digit 58-47 lead and also put some psychological pressure on Starlites with only one quarter of play remaining. Ward and Darley banged in early treys to raise Starlites’ hopes but in came Pace, at the opposite end, to maintain Gżira’s slender but important lead. Two back-to-back Crossland hoops, four minutes from the final buzzer, had Sasa Dimitrejevic’s side go 75-64 ahead. Starlites made a final push and did have four treys with Ward and Stotts respectively scoring a brace but Gżira Athleta did not stay put and also got their points, some on transition play, to enjoy a double-digit lead coming into the final minute. With Starlites trying to stop play, Athleta did not miss the resultant penalty free throws to ascertain the victory. 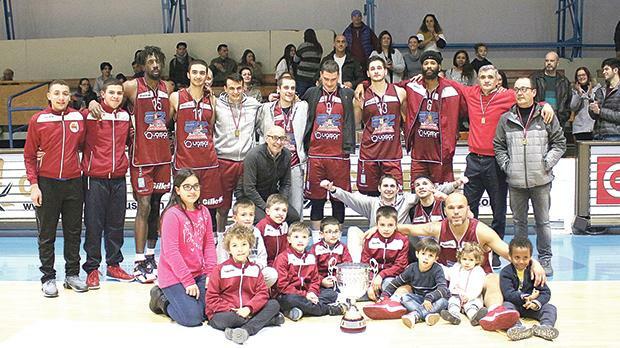 At the end of Sunday’s secon leg, Louis Borg presented the winning trophy and medals to Gżira Athleta who celebrated their tenth success in the competition.